Startseite / Homepage - thassos-kreaktivs Webseite! Relaxen, baden, malen, wandern durch romantische Bergdörfer und Ausgrabungen. Genießen Sie die inspirierende Atmosphäre der Insel! Die Natur in der Stille betrachten. In seine Mitte kommen und sich spüren. die Sonne in jede Zelle unseres Körpers lassen. Beim Malen leite ich sie gerne an. I would like to talk to you about my creative holiday program on the beautiful green island of Thassos. Experience your holidays in the lush nature under the pine trees. 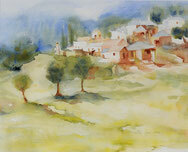 Relax, swim, paint and wander through romantic villages and ancient sites. Enjoy the inspiring atmosphere of the island! Take in nature in silence. Come to your centre and your awareness. Feel the wind on your skin and absorb the sun in every cell of your body. I will gladly be your guide to painting.